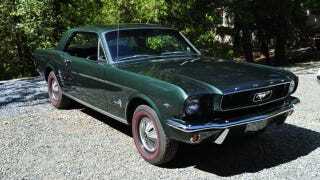 Chris Snow bought his son a '66 Mustang as a 16th birthday present. He and his son worked on the car together. Now it's been stolen and he is offering no less than $10,000 to get it back. Chris and Jeremy Snow worked with Ringold Creek Mustang on restoring this beautiful V8 Mustang Coupe together for six months . Last Wednesday, Jeremy parked the car in front of his high school in Davis, California and when class got out, it was gone. Jeremy told Fox 40 News how he misses the car. More than anything, it was what the car meant to me, not the money value of the car. Chris has filed a stolen car report with the Davis PD and he urges you to contact them if you see the car. The Davis PD's non-emergency number is (530) 747-5400. You can also reach Chris himself at (530) 304-6531. The tipster who leads to the return of the Mustang will be offered the $10,000 reward. With cars like these, however, the cars are often parted out. Chris has set up this Craigslist page with detailed photos to help identify any parts. If anyone tries to sell you parts from this car, please contact the Davis Police department.